The Acrocanthosaurus is a large, playable carnivore in Beasts of Bermuda. It is one of the slowest carnivores in the game, only being faster than the semiaquatic Ichthyovenator's terrestrial movement speed. However, it has the highest damage output and the strongest bite of any carnivore currently in-game. It also has the highest health and size. The Acrocanthosaurus is a superb ambusher due to its high damage output. It is the carnivore most capable of hunting the huge Apatosaurus and the swift Parasaurolophus. Its attacks are fairly straightforward, possessing both a forwards-aimed and a downwards-aimed bite as its primary and secondary attack. Special Abilities: Acrocanthosaurus is able to inflict terrible bleeding wounds on its opponents. Bleeding is a status effect that damages health, comfort and raises injury damage. This allows the Acrocanthosaurus to engage in persistence hunting, wearing its prey out over long distances while they succumb to blood loss. A skilled Acrocanthosaurus can fell even the largest of creatures, so long as they are not allowed to recuperate. It has also an Alarm Calls like the Parasaurolophus which allow to follow a prey on a very long distance and it has the same feature than the Parasaurolophus. 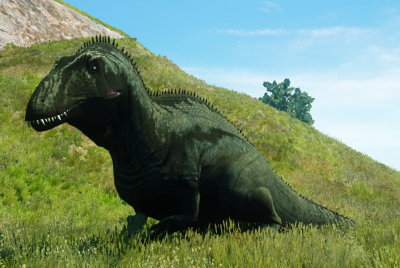 Other facts: The Acrocanthosaurus will be the second strongest carnivore in the EA release, after the Tyrannosaurus. It makes up for the lack of power to Tyrannosaurus with superior speed, meaning it is able to pursue a wider variety of prey over long distances. The Acrocanthosaurus is capable of doing a small jump that costs significant stamina. It serves the only purpose of allowing the Acrocanthosaurus to avoid getting stuck on small ledges or rocks in certain areas, granting little other utility. The Acrocanthosaurus has a very mild amount of weather resistance and must take refuge from intense weather. It also has a fast metabolism and must eat regularly to avoid starvation. Cliff Build - be able to maneuver around cliffs faster than your prey and gain the high ground. There is a super powerful Acrocanthosaurus known as the Demon Acro, which patrols the temple on the map. It is extremely powerful and guards the secrets of the temple. Tread wisely.